TENNIS: Andy Murray remains on track in his bid to finish the year as No.1 after a thrilling win over Kei Nishikori at the ATP World Tour Finals in London. The Brit will now face US Open champion Stan Wawrinka on Friday night (midnight AEST) all but assured of progressing to the semi-finals of the round-robin tournament. Only a straight-sets defeat would deny him a spot in the last four. Barring any semi-final upsets, Murray would then meet arch-rival Novak Djokovic in Monday morning's final to decide who finishes as the world No.1. Djokovic, overtaken last week by Murray after 122 weeks on top, has already won his group after defeating Dominic Thiem and Milos Raonic, even before Thursday night's match against alternate David Goffin, who is replacing the injured Gael Monfils. "I mean, I think for the tournament, for everyone interested in tennis, that would probably be the perfect way to finish the year,” Murray said. "For me and I'm sure for Novak, both of our goals would be to try to win the event. For him, whether that's by beating me, someone else, or for me if it's winning against Novak or another player, it doesn't change for us as players. Not since 2001 has the No.1 ranking changed in the final week of the season. On that occasion Lleyton Hewitt dethroned Gustavo Kuerten in Sydney. Should Djokovic, winner of the Tour Finals for the past four years, and Murray, still trying to win it for the first time, meet in the final it what would be their first clash since Djokovic's French Open triumph in June. 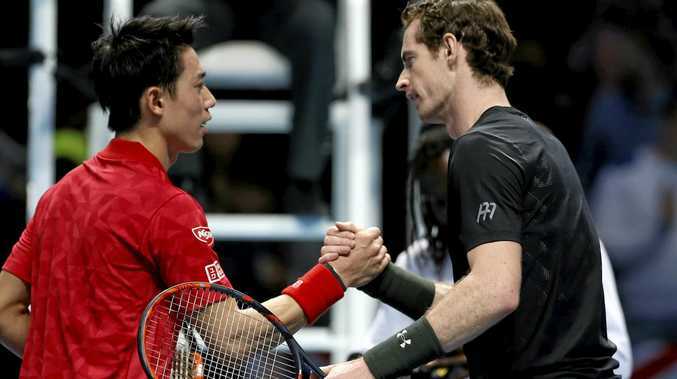 Murray was made to work by Nishikori, who claimed a 20-point tiebreak to win an 85-minute first set. But he fought back to claim a 21st consecutive victory in three hours and 20 minutes, 6-7(9) 6-4 6-4. It avenged his five-set defeat at the hands of Nishikori in the US Open quarter-finals - his last loss.